If there’s one thing Shawn Mendes fans are dying to know, it’s the status of his love life. Although he pours his heart into his songs, everyone really wants to know if he’s dating anyone. Does he have a secret girlfriend? Or boyfriend even? Well, he just got real yet again, clarifying the rumors and letting the world know that no, he’s not gay in case you were wondering. Speaking to Rolling Stone, the 20-year-old “In My Blood” crooner admitted that he, like most people, often ends up caring too much about what others have to say about his personal life, specifically when it comes to the rumors that he’s gay. “I thought, ‘You f–king guys are so lucky I’m not actually gay and terrified of coming out’. That’s something that kills people. That’s how sensitive it is. Do you like the songs? Do you like me? Who cares if I’m gay?” Shawn said to Rolling Stone. He took to his Snapchat two years ago to deny the rumors and also point out his frustration over the fact a person’s sexuality is not something others should use as an insult by any means. Again in 2017, this rumor came back with a vengeance when a fake tweet circulated seemingly from Shawn’s official account that looked like he was coming out as gay. #ShawnComingOut was even a hashtag people were quick to start using. “Guys my sexuality shouldn’t be anyone’s business. yes, i’m gay and i’m proud,” the tweet read. This tweet was 100 percent not real and his loyal fans were quick to come to his defense. And while the singer had made it clear that he’s not gay a few times now, he did go on to tell Rolling Stone that, unfortunately, the constant speculation is something he still worries about. 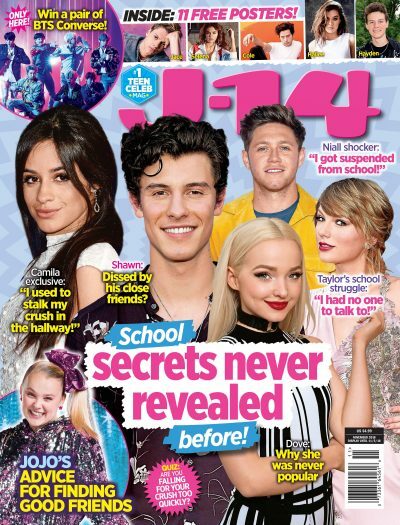 Shawn brought up how in August after he performed with his friend Taylor Swift, she texted him asking if it was cool for her to post a funny video on her Instagram Story of the singer hanging out backstage where she was putting glitter eye makeup on him. He was totally fine with it at first but admits, later on, he wasn’t so sure if that was the best move. “I felt sick. I was like, ‘F–k, why did I let her post that?’ I just fed the fire that I’m terrified of,’ he said. “Maybe I am a little more feminine — but that’s the way it is. That’s why I am me,” he said. And Shawn, there’s nothing wrong with that!